FILE - Sen. Luther Strange, R-Ala., responds to questions during a TV news interview on Capitol Hill in Washington, July 11, 2017. U.S. President Donald Trump has touted Senator Luther Strange’s commitment to family values and the Republican agenda in a campaign rally late Friday in the southern state of Alabama. “He is going to be great. He’s tough on crime, he’s tough on borders,” Trump said. He said Strange will protect the 2nd Amendment, the one giving Americans the right to bear arms. “When it comes to Washington and taking on the bureaucracy, Luther is your man. He’s tough as hell. He’s determined to drain that swamp,” Trump said, reverting to one of his campaign slogans describing corruption in Washington. Trump appeared at Strange’s campaign rally after endorsing him last month. Strange is competing against opponent Roy Moore in a special runoff election to fill the Senate seat vacated when Jeff Sessions became attorney general. Strange was appointed to the seat when Sessions left, but he must win the special election Sept. 26 to keep it for a full term. The president said Friday his support of Strange has bolstered his candidacy, but predicted on Twitter the race will be close. Despite the president’s support, Moore, a former Alabama chief justice who was twice removed from the bench for disobeying judicial orders, has maintained a lead in the polls. He is campaigning on an anti-Washington platform and is known for unsuccessfully pushing for the public display of the Ten Commandments and opposing gay marriage. During a debate Thursday night, Strange emphasized “the president supports me,” while Moore argued that Strange supporter Senate Majority Mitch McConnell and other members of the “elite Washington establishment” were trying to influence the race. A super political action committee linked to McConnell has injected millions of dollars into the race amid Republican concern Moore would be a disruptive force in the Senate, or possibly lose to Democrat Doug Jones. FILE - Former Alabama Chief Justice and U.S. Senate candidate Roy Moore speaks to supporters in Montgomery, Alabama, Aug. 15, 2017. 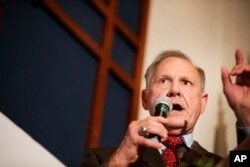 Moore also has high-profile support, led by former White House chief strategist Steve Bannon and his conservative website Brietbart News. Additionally, Moore has the backing of former White House adviser Sebastian Gorka and former Alaska Governor Sarah Palin. While Trump claims his support of Strange has narrowed Moore's lead in the polls, the latest RealClearPolitics polling average completed on September 17 shows Moore with a nearly 9-point lead. Moore led Strange in the first round of Republican voting, although the margin was not wide enough to avoid a runoff election, which will be held next Tuesday. Some political observers say the runoff will be an early test of Trump's influence over his political base. Republican leaders are concerned about the impact a loss by Strange could have on Trump's political strength ahead of the 2018 mid-term elections, as well as Republicans' ability to advance Trump's agenda in Congress.